Here at Woodland Park Zoo, we develop many sizes of partnerships with all sorts of community organizations, but sometimes the sweetest of such partnerships are the simplest and directly in our neck of the woods. This is exactly what we realized when we recently got a call from Herkimer Coffee, located just a few blocks away from the zoo on Phinney Avenue. Sure, several zoo staffers and volunteers get their morning or afternoon pick-me-ups here, but Herkimer manager Chad Smith was thinking about the zoo on a deeper level. 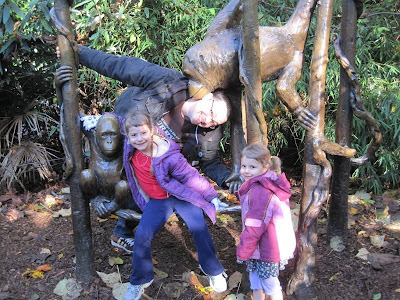 He and his family not only love the zoo as members, they’ve also spent time here and on their own learning about orangutans. 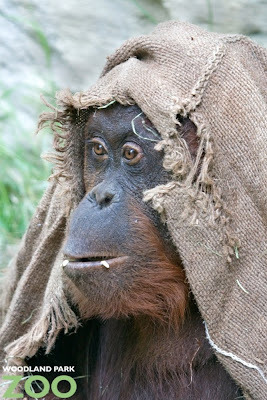 They share our same strong affinity for these inspiring and intelligent primates. Chad specifically noticed that we use burlap bags in our orangutan and gorilla exhibits. 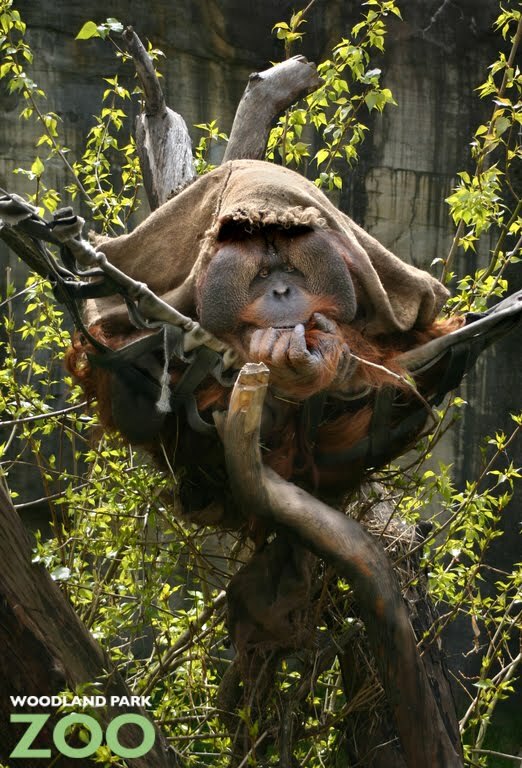 In case you didn’t know, orangutans are arboreal, living in treetops, and they rarely come down from the trees. When they do, one of their tendencies is to create nests to sleep in or they blanket themselves with leaves for weather protection. 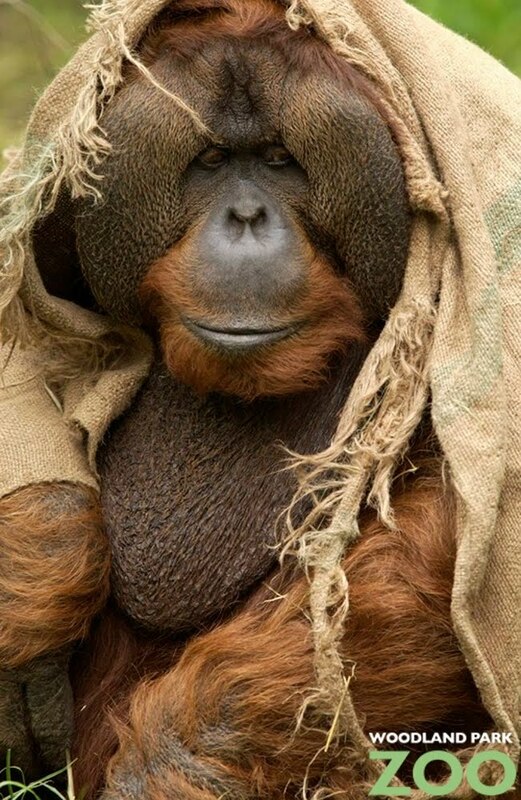 The burlap bags that are available to our orangutans offer the same sense of security and care. Our gorillas also use the burlap bags for enrichment activities and they love to play with them. 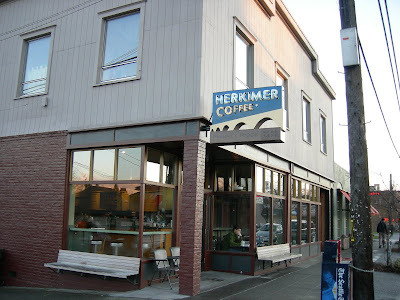 Back at Herkimer, they receive green, un-roasted beans in burlap bags from all over the world, and roast them on site, leaving them with plenty of empty burlap bags. The leftover bags are then frequently used as packing materials. But this time, Chad kindly contacted us to see if he could donate these bags so we could reuse them for our orangutans and gorillas. These bags are inspected for stickers, labels and the occasional bean left in a seam, but other than that, they usually arrive in clean and safe conditions for our animals. With our orangutans, we typically rotate 12 bags in their exhibit while another 12 bags are drying after being hosed clean. These bags are rotated until they can no longer be cleaned, or start to fall apart. Due to the short life-line of burlap bags and the good times that our animals have with them, the zoo has always been in need of such donations. That’s why this Herkimer donation has quickly become an ongoing partnership. Also, we’re happy to be working with one of our many great Phinney neighbors and such big fans of the zoo. 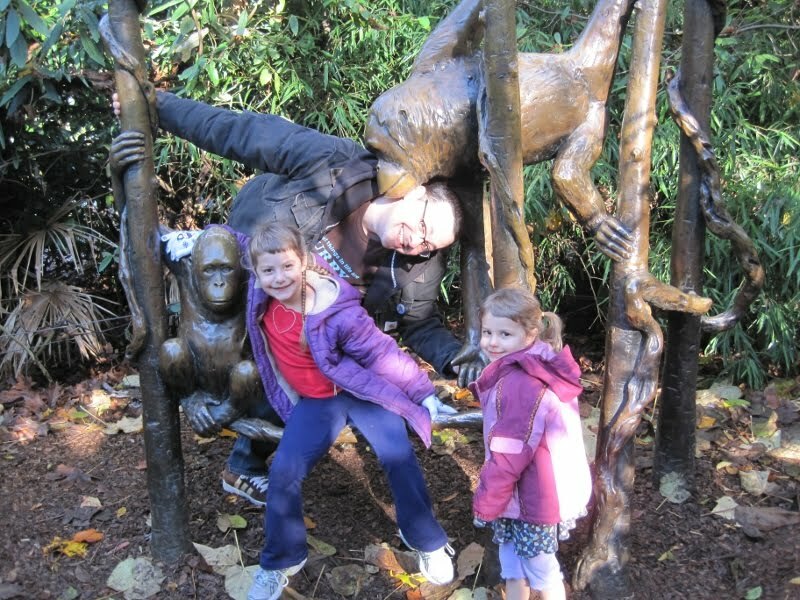 To sweeten this partnership even more, Woodland Park Zoo keeper Stephanie Jacobs recently offered a talk at the orangutan exhibit with Chad and his two young daughters (pictured above) to heighten their understanding of orangutans. So, the next time you Seattle or Phinney locals visit our orangutans or gorillas, you can be proud of the fact that the burlap bags that our animals are seeking comforts from were donated and recycled through a local company just down the street. Thank you, Herkimer! Photos (top to bottom): Joe Mabel, Dennis Conner/Woodland Park Zoo, Dennis Dow/Woodland Park Zoo, Dennis Dow/Woodland Park Zoo, Roxanne Murphy/Woodland Park Zoo courtesy of the Smith family. Getting ready for Thanksgiving? Enjoy this clip of our Komodo dragons gulping down a turkey treat. The footage was featured nationwide on NBC's Today Show. Watch the video below or visit the Today website to view. The turkey treat was given to the Komodo dragons and other zoo carnivores at our annual Turkey Toss enrichment event, held last Saturday. Turkey Toss is part of the zoo’s ongoing enrichment program to help enrich the lives of the zoo’s animals, promote natural animal behavior, keep animals mentally and physically stimulated and engage zoo visitors. Though the winter storm watch advisory caused the zoo to close early today for visitor and staff safety, the animals did quite well in the snow. They have indoor access and heated areas, but some chose to go out and explore in the snow anyway. It can be quite enriching for them! If the snow continues to impact zoo operations, we'll post updates to our website at www.zoo.org. Be safe out there, everyone! Photos by Ryan Hawk and Dennis Dow/Woodland Park Zoo. This week, we released the first of six prints for our Limited Edition campaign, this one highlighting the endangered African wild dog. 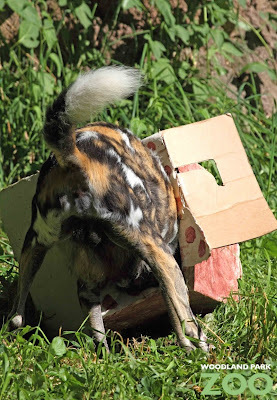 With only 3,000 African wild dogs left in the wild, this is a species on the edge, surviving in scattered packs across sub-Saharan Africa, a result of habitat loss and fragmentation. What isn’t fragmented is this species way of life in the pack—their social structure is remarkable. Even the scene at a kill for these carnivores is polite and orderly, with pups eating first while the adults fend off scavengers. How do they keep the peace? They frequently use ritualized gestures of appeasement to prevent any serious infighting. Most appeasement behavior is ritualized food-begging, but other gestures are familiar to anyone who owns a pet dog, such as whining, tail-wagging, and rolling over to expose the belly. 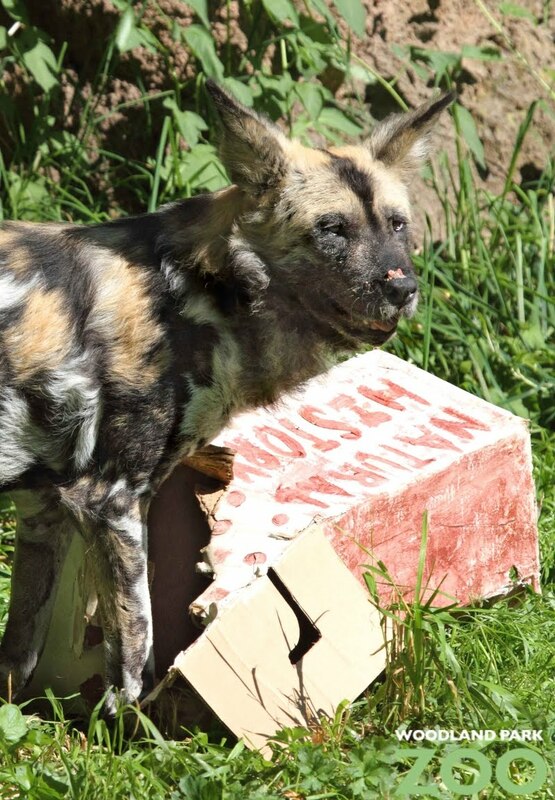 You can see some of their hunting instincts at work if you ever catch our African wild dogs enjoying a special enrichment treat, like the box full o’ meat seen here that they recently enjoyed thanks to some zoo campers who put together this enrichment for them. Want to help us celebrate this species? 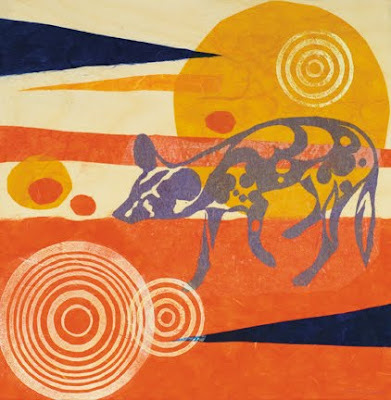 You’ll find the original artwork by Fumi Watanabe up for auction this week (along with the other five, gorgeous works in the series) and limited edition prints available at the ZooStore West and online. You can also purchase an African wild dog cupcake at Trophy Cupcakes locations through Sat., Nov. 20 and proceeds will go to support Woodland Park Zoo. A new limited edition endangered species cupcake and print will be released each Sunday over the next five weeks. Yum! 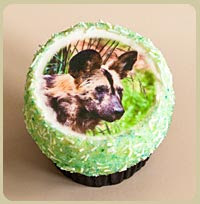 Artwork by Fumi Watanabe; African wild dog photos by Dennis Dow/Woodland Park Zoo; cupcake photo courtesy Trophy Cupcakes. Animals shouldn’t come in limited edition, yet dwindling wild populations have one fifth of the world’s vertebrates teetering on the edge of extinction. This fall, we launched our Limited Edition art campaign to draw attention to the plight of endangered species, what we’re doing to conserve them, and how you can help. The campaign started with billboards around town showing artist renditions of six of the endangered species Woodland Park Zoo is working to save: Panamanian golden frog; western pond turtle; African wild dog; Sumatran tiger; golden lion tamarin; and red crowned crane. The six works of art, shown above, were designed by prominent Pacific Northwest artists Troy Gua, Natalie Oswald, Fumi Watanabe, Don Clark, Fiona McGuigan and Jesse LeDoux. The numbers scribbled in the left-hand corner of the billboards—evocative of limited edition artwork—represent the number of individuals of that species remaining in the wild: 1,100 western pond turtles, 1,000 golden lion tamarins, 400 Sumatran tigers. But there is hope and we can all be part of the solution. In a study released in October by the International Union for Conservation of Nature, biologists reported on the remarkable impact conservation efforts have had on reversing the extinction trend. According to the report, the status of biodiversity would have declined by nearly 20 percent if conservation actions had not been taken. Woodland Park Zoo is proud to play a role in such conservation efforts worldwide that are making a difference. We support 37 conservation programs in 50 countries, restoring habitat, protecting wildlife, educating people and improving community livelihoods. You can help support these conservation projects and the zoo’s work in animal care and education by getting involved in the Limited Edition campaign. Art Open House – Sun., Nov. 14, 1:00 – 3:00 p.m.
Meet some of the artists and see the original works up close at the ZooStore West. Mini Trophy Cupcakes will be served (while they last!). Bid on the original works of art from Sun., Nov. 14 – Sun., Nov. 21. Purchase prints of each work at the ZooStore or online. One work will be released as a limited edition print each week for six weeks, starting Nov. 14. 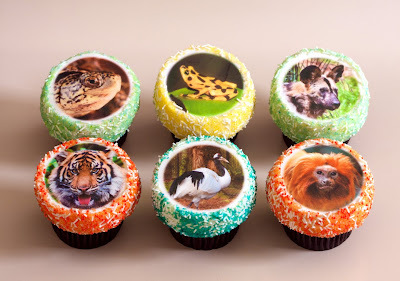 From Nov. 14 through Dec. 18, Trophy Cupcakes will release a new Limited Edition cupcake each week (two the week of Dec. 12), featuring one of the six animals highlighted in the campaign. Purchase a Limited Edition cupcake at any Trophy Cupcakes location, and 100% of profits from each sale will go to help support Woodland Park Zoo. One of the best tools we have in conservation is conversation. Double your impact and tell a friend about the conservation concerns you have, and share with them some ways to help—from taking action with Woodland Park Zoo through our Limited Edition campaign to making eco-friendly choices at home. Click the Recommend button below to share this story on Facebook and get your network talking. Any way you choose to get involved, you’ll be helping Woodland Park Zoo and our work around the globe. Thanks for all you do! 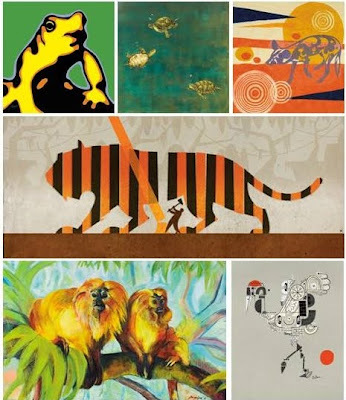 Art (clockwise from top left) Panamanian golden frog by Troy Gua; western pond turtle by Natalie Oswald; African wild dog by Fumi Watanabe; Sumatran tiger by Don Clark; golden lion tamarin by Fiona McGuigan; red crowned crane by Jesse LeDoux.